NFL Draft: Which Schools Develop Their Players? If all the turmoil in Columbus eventually costs Ohio State coach Jim Tressel his job, the Buckeyes will lose more than a winning coach. They'll also be getting rid of the top developers of NFL talent in college football. At least that's my conclusion after checking out Dave Bartoo's new analysis of recruiting rankings and NFL draft picks over at College Football Matrix. Bartoo's a big proponent of the value of recruiting rankings when it comes to predicting success in the BCS, and his latest work suggests a meaningful correlation between recruiting rankings and the number of NFL draft picks a school produces. Also, looking at these numbers, I think it's fair to say that some programs really do excel at preparing their players for the pros – or, at the very least, making them attractive to NFL scouts. Of course, others really stink. *The negligible difference between Oklahoma's recruiting ranking (sixth) and draft ranking (eight) falls pretty much in line with expectations. And, sorry, 'Horn haters, but the same goes for Texas, which ranked sixth in recruiting and 10th in the number of draft picks. *It's amazing how closely the numbers match up with our perceptions in many cases. It probably won't come as a shock to Big 12 fans that Texas A&M and Oklahoma State look like major underperformers, for instance. Conversely, Frank Beamer is apparently getting more from less in Blacksburg. *The Big 12 doesn't fare too well, period. Is it possible that recruiting in the Texas area is actually a tad bit overrated? 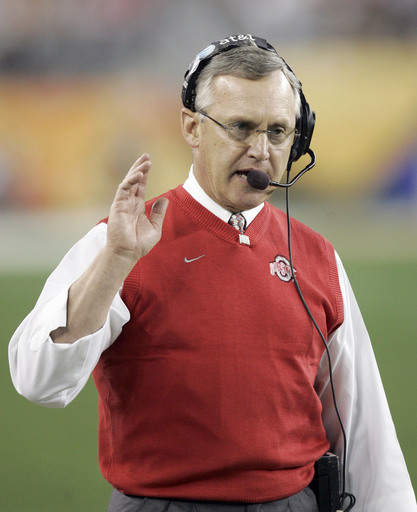 *As I alluded to earlier, the fact that Ohio State has churned out so many draft picks is a testament to Senator Sweater Vest. Considering that OSU, which is ranked 10th in recruiting, put as many guys into the NFL as recruiting juggernaut USC during the period covered in Bartoo's study, that speaks pretty well of the program Tress is running. *Tressel is keeping some good company in the Big Ten. I guess there really is something to Kirk Ferentz's rep.
*It should be noted that the teams that finish near the top of the recruiting rankings really can't do much better than hold their position relative to the draft rankings, so it's a little unfair to make any hard judgments there.